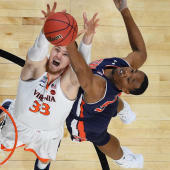 The second round of the 2019 NCAA Tournament is underway, and the excitement that is March Madness is in full effect. There are eight remaining places in the Sweet 16 that will be decided Sunday, and there's three No. 1 seeds in action (Duke, North Carolina and Virginia) looking to earn their spots. We also know at least one Cinderella will punch its ticket when No. 13 UC Irvine takes on No. 12 Oregon. Plus, a pair of smaller programs will look to advance to the second weekend while not filling the traditional Cinderella moniker in Houston and Buffalo. The two teams have a combined six losses on the season.